HubSpot’s CRM is the foundation of the platform, the place where the Marketing Hub, Sales Hub, and Service Hub converge. It’s a massive data hub where every interaction you have with a customer is filtered and cataloged—and more importantly, it’s where Unific can help you extract the most value out of your data. The HubSpot CRM has seven main components: Contact Records, Deals, Product and Order Item Records, Company Records, Lists, Workflow Memberships, and Tickets. Each of these areas keeps track of different and unique customer information, and Unific interacts with each in exciting, useful ways. This section is a timeline of your communication and interaction with any individual contact that has engaged with your company. You can filter this timeline by specific events and interactions, including Communication, Team Activity, Contact Activity, Updates, Integrations and more. For most businesses, this is one of your most important information hubs for your business, and when you connect with Unific, we add additional custom fields organized by property group that greatly expand your knowledge base. This category creates custom fields designed to help you separate and track your Top Customers. It includes metrics like Average Purchase Amount, Last Date Purchased, and many more. With these, you can see which of customers are outspending others, or are buying more frequently, in order to better target them. This category is designed to help you see which coupon codes are resonating with your customers. With metrics like Last Coupon Used, you can easily find out what types of sales ( and on which products)appeal to different customers and change your strategy accordingly. The category helps you know which products and SKUs are flying off the shelf, and which item categories your customers are drawn to. This can be integral in figuring out which products and SKUs you should put your focus on. This field lets you look at a customer’s last purchase by product, price, name, and other metrics to see buying patterns across your sales. This category gives you tons of insights to help you create Abandoned Cart campaigns. You can look at abandoned carts by metrics like date abandoned, products left, SKUs abandoned, and more, allowing you to find specific products that customers are walking away from, and figure out a campaign to pull them back. We give you all sorts of metrics around the customer ordering process, including typical sales tax incurred, shipping addresses, shipping tracker checked, and more. For those of you with multiple storefronts, you can use this field to track customers across your brands to see which stores are getting the majority engagement. Lastly, for those of you who can get enough data, an additional list of 18 segments you can use to gain even more insights on your customers. Web Analytics: HubSpot includes a lot of data you’re used to finding in Google Analytics. The difference is that Google Analytics type data is directly associated with contacts. When Unific syncs data from your shopping cart, we include the HubSpot UTK. The HubSpot UTK tracks anonymous and known visitors on your shopping cart or website (or any number of shopping carts and websites). All your contact’s browsing activity, including product page views, is tracked and available for segmentation and automation. For instance, if one of your customers views one of your top products but does not buy, you can automatically start a browse abandonment workflow. With deals, each order status from your shopping cart turns into a pipeline stage. As customers place orders in your cart, Unific creates a “deal.” As the order is updated, the “deal” is moved between the pipeline stages. Any field related to someone's’ billing or shipping address, postal code, and more to have a clearer picture where and how your customer’s like to receive your products. We track every last interaction someone has had with your company, from last Category or Product bought, to Last Order Number and Shipment Date. You can easily use this to find customers that haven’t bought in a while, and start a new workflow against them. Know which type of sales work on which type of your customers by tracking your coupon code data. From discounts used, to net order values, to average taxes, you can find all of the nitty-gritty payment and pricing data here. 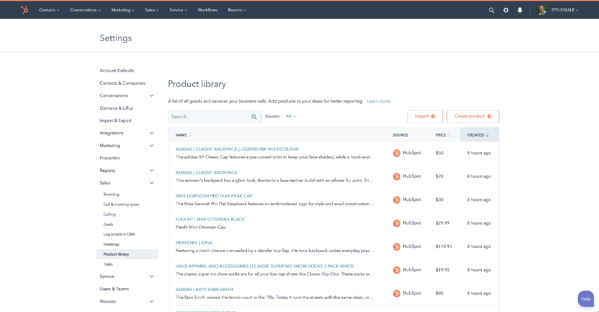 When you first connect your shopping cart to Unific, Unific adds your product library to HubSpot. When when Unific syncs an order, we create a deal and then add the products bought as Order items on the deal. 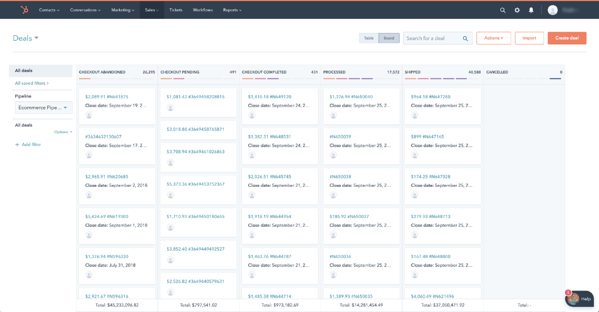 This helps streamline the sales process behind the scenes, so you can see exactly what products are in what stage of the sales/shipping pipeline at any time. Company record works the same way Contact Record does, but the focus is on recording every interaction you have with a specific company, and the individuals in that company. Company records are particularly useful for merchants that have both an inside/field sales organization working in conjunction with self or assisted checkout on a shopping cart. Within HubSpot is a setting to automatically create companies and associate contacts to companies based on email address domains. Unific works much the same way with Companies as it does for general Contact records, storing Company information, Social media analytics, Web analytics, and Conversion information while also generating its own data sifting fields that we listed above. We automatically create several “Smart Lists” to help you find and segment your Top Customers. Some of these lists include info around Repeat Buyers, At-Risk Best Customers, and more. For more information on this lists, you can look at the HubSpot Ecommerce Playbook or our in-depth blog piece on the subject here. Lastly, we have tickets. Tickets include any interaction that requires your input, with the simplest example being a support ticket that’s generated when a user asks for help on your website. All the contacts current and former tickets from HubSpot Service Hub will show up here. 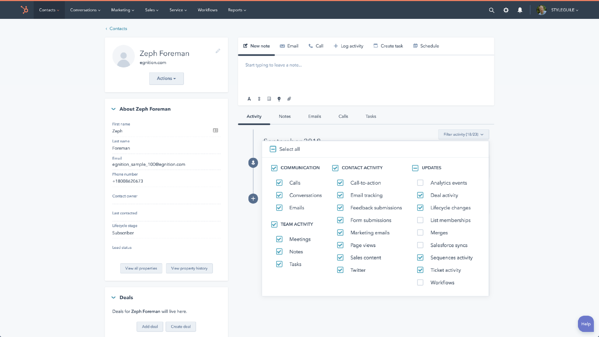 We hope this was a useful primer on the main elements of the HubSpot CRM Platform, as well as a good look at how Unific can help you achieve deeper insights and more opportunities to target your Top Customers. For more information on HubSpot and the ways in which Unific can supercharge your experience with it, click here to learn more.